Over on the New York Times Wellness blog, some researchers at the Norwegian University of Science and Technology in Trondheim have developed a low-tech means of assessing aerobic fitness and estimating your “fitness age.” I made my selections on their rather simple online calculator and got this. 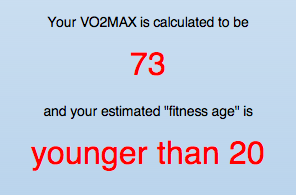 Must be time for me to visit the cosmetic surgeon because I look closer to my VO2MAX rating than I do my fitness age. Did you enter your waistline in inches rather cm? That's the only way I could get that calculator to generate such a high VO2-max (70 is average for Division I collegiate distance runners). Also note they are using dog years. You may need to convert?